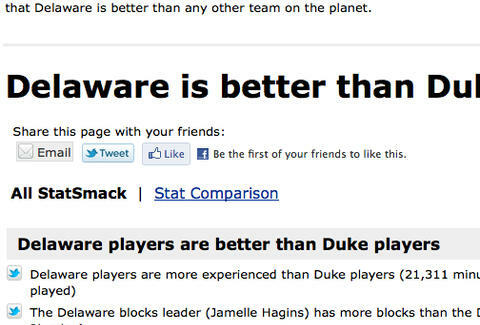 From a posse of sports junkies who recently released in-depth stat analysis for every Div-I b-ball program in the country, 'Smack's a brand spankin' Web app offering empirical proof of your school's superiority, highlighting its statistical strengths compared to any D-I program via easily comprehended bullet-points, which due to their violent overtones will from hereon out be known as Wizards-points. 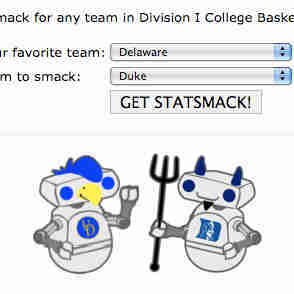 Simply select your squad (and your soon-to-be-decimated rival) from the dropbox, and Stat'll search its proprietary database of 1 billion+ stats using an algorithm primed to analyze the key areas where your school excels, from on-court aspects like head-to-head record, tournament wins, and avg player height, to campus pride such as graduation rate, and violent crimes per capita...oh god, if only we'd changed bullet-points sooner! You can easily email or tweet any stat should you wish to start the pwning immediately, and, if basketball isn't your bag, stay tuned for an MLB version set to launch when the season starts, an event that research shows 11 out of 10 people are excited for.